“Your brand is what other people say about you when you’re not in the room.” This slice of Jeff Bezos wisdom is likely not new to you. For marketers it naturally raises several more questions: What do they say when I’m not in the room? What do they like? What don’t they like? Who or what else do they talk about? The answers to these questions reach beyond brand and even marketing. They provide insights that can inform an entire business strategy. Before the proliferation of social media, brands sought these insights through a variety of different tactics: surveys, focus-groups, shop-alongs. But social—unlike most communication channels— offers an equally, if not more effective solution. We all benefit because you can intimately understand your audience, helping to better build community and connection. A connection consumers crave; a connection that comes with a tangible business impact. According to our most recent Brands Get Real report, 76% of respondents expressed that they are more likely to buy from a brand they feel connected to than a competitor. But simply listening isn’t enough. Putting insight into action is where brands truly capture the opportunity to better drive connection. Offered as a new Premium Add-on, Sprout’s Advanced Listening solution is fully integrated alongside the engagement, publishing and reporting tools you rely on everyday. 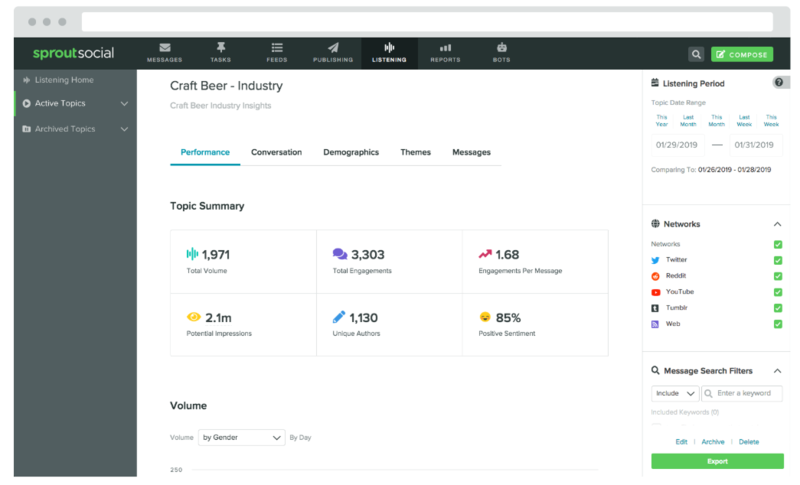 Now you can use consumer and market insights to make more informed marketing and business decisions—and enact them all from one unified platform. Being integrated alongside industry leading publishing and engagement tools means you can quickly turn insight into action to capture identified opportunities. Sprout’s robust content planning tools, for example, are never more than a click away. As you and your team uncover inspiration for content, everyone can easily produce drafts and collaborate on post creation—or even take advantage of the moment and publish right away. In addition, take your day-to-day brand monitoring a step further and turn it into brand analysis. As you start identify common threads in your Smart Inbox or are notified about interesting events with Message Spike Alerts, you can turn to your brand-related listening Topics to find trends, track sentiment and see a fully informed picture. 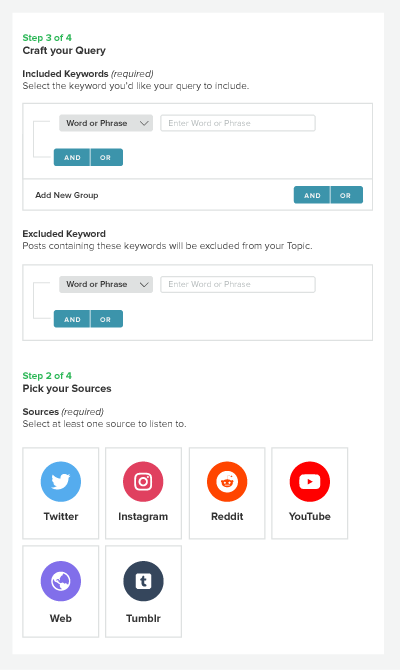 Advanced Listening also brings new channels into the fold with data from Twitter, Instagram, Reddit, Youtube, Tumblr, Blogs, Forums and more to make sure you can get a complete view of the social conversation around your desired topic. The power of social listening data and the benefits of an integrated solution are multiplied through accessible design. Sprout’s new Topic Builder has reimagined the traditionally cumbersome process of constructing queries. Building rich, low-noise queries is easy and doesn’t require you to be an expert in Boolean search. While building your query, the Topic Preview gives you a look at the data that will be included so you can make necessary adjustments to ensure you measure twice and cut once. Seamless Topic building is only one part of making listening accessible. 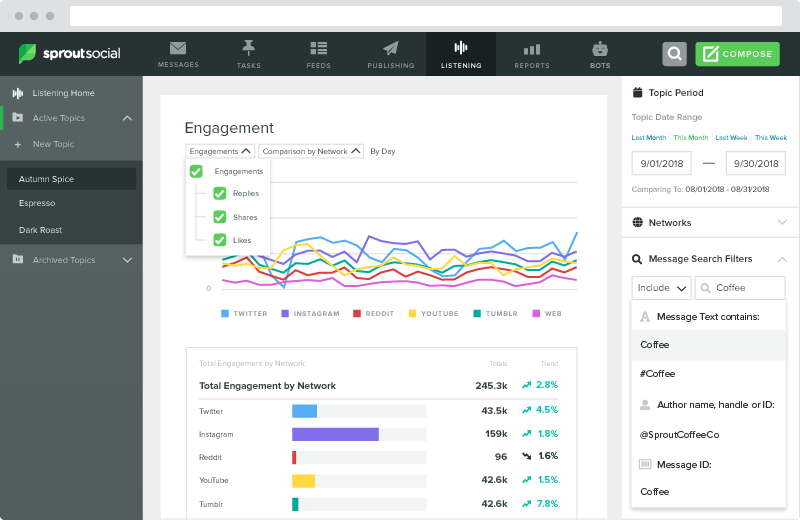 Analyzing and interpreting the data is as intuitive as one would expect from Sprout. Not only does the layout make it easy for the social team to highlight top content, spot trends and find influencers, but beautiful data visualizations and contextual tools, like the Word Cloud, are designed to be approachable for those not familiar with the social space. Your team’s time should be spent acting and analyzing, not implementing. Making the data accessible requires more than just intentional design. Performing research and data analysis to answer tough questions requires data be offered in a flexible format. Sprout’s listening tools are bursting with ways to slice and dice your data. Every chart is dynamic offering multiple ways to breakdown metrics or tailor the visualization with exactly what you need to see. Each table is sortable and can be customized to add, remove and rearrange data as needed. In addition, the keyword search capability offers a “search engine for social”, making it easy to quickly dive into different focus areas within your brand, industry or competitive Topics. Quickly sorting through a large data set based on keywords, hashtags and users unlocks targeted analysis without the need to set up brand new queries. Data analysis has never been easier—track sentiment, identify emerging trends, calculate share of voice insights and benchmark content performance, campaign success and competitors. Coupled with with an intuitive layout and filtering capabilities, Advanced Listening gives social teams the channel coverage they need to perform deep dive analysis into their campaigns and audiences, product teams the insights required to develop new products or align existing products with consumer demand, and CMOs the competitive intelligence required to develop an empathetic, and effective strategy. If you’re ready to start driving your strategy with listening insights, request a demo of Sprout Listening here.